Will Xi and Abe Meet at APEC in Beijing? It is time for both leaders to begin repairing the battered relationship. At an international conference in Honolulu recently, a Japanese scholar asked me: Will President Xi Jinping and Prime Minister Shinzo Abe meet in Beijing during the upcoming APEC summit? “Maybe,” I said. Since this is a very serious question, I think it deserves a more careful answer. Sino-Japanese relations have taken a nosedive since 2012. Since then, the two countries’ top leaders have been busy traveling around the world – sometimes on each other’s heels, as evidenced by Xi’s and Abe’s most recent visits to Latin America where they were only separated by a couple of days – yet they have not visited each other nor met bilaterally. The only place they could meet now is in a multilateral setting, yet even there a bilateral meeting is not guaranteed during the APEC summit to be held in Beijing in November. The Japanese side, including Abe himself, has expressed a strong desire for a bilateral meeting in order to mend the seriously damaged relationship. Recently, Xiong Bo, a deputy director general of the Asian Affairs Department of the Chinese foreign ministry, met a senior official from the Asian and Oceanian Affairs Bureau of the Japanese foreign ministry and discussed the potential of a Xi-Abe meeting at APEC. Xiong expressed China’s concern about Abe’s visits to Yasukuni Shrine and his position on the disputed Diaoyu/Senkaku Islands, and questioned Japan’s sincerity. After this initial meeting, Chief Cabinet Secretary Yoshihide Suga issued a statement on July 9 saying that the Senkaku islands, as Japan’s inherent territory, should not be an obstacle for Chinese and Japanese leaders to meet at APEC. As for the visit to Yasukuni Shrine, Suga wrote it off as more spiritual than political. Qin Gang, spokesperson for China’s foreign ministry, immediately criticized Suga’s statement and pointed out that there is no foundation for China and Japan to talk if Tokyo was not willing to change its attitude regarding the two sensitive issues. If Japan is insincere about improving its relationship with China, then talk is futile, said Qin. As the host of the APEC summit, Xi probably should seize the opportunity to have a serious dialogue with Abe, but he faces considerable domestic pressure to be tough. These are two proud nations and two strong leaders, with two adamant but opposing positions. What can be done to pave the way for a meaningful Xi-Abe meeting? Political wisdom and courage are required on both sides to correct the current diplomatic stalemate.In the weeks leading up to the APEC summit, both sides need to take steps to create an atmosphere conducive to the bilateral meeting. An initial step for Abe to take would be to make a public statement that he will not visit Yasukuni Shrine again for the sake of improving relations between Japan and its neighbors. In return, China should consider scaling back its air and maritime patrols of the disputed islands. The two countries should basically attempt to return to the pre-2012 status quo. Abe’s actions – from visiting the Yasukuni Shrine to pushing for Japan’s collective self-defense – have added fuel to the fire and further antagonized China. Most believe his foreign policy is intended to satisfy the right-wing element within Japan, and some argue that the prime minister is right-wing himself. 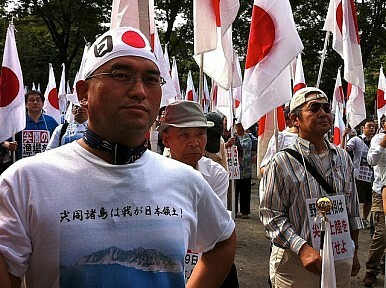 However, the so-called right-wing is only a small minority of the Japanese population. Japan remains a pacifist nation with the majority of its people being rational and peace-loving. It is high time that Abe demonstrated some political wisdom. If he pledges not to visit Yasukuni Shrine again as prime minister, he may be pleasantly surprised to find his domestic approval rating rising, because the majority of the public will think that he is prudent and has the courage to improve Japan’s relations with China and South Korea. He will not be perceived as weak; instead his already strong leadership will be further boosted at home. On the other hand, rather than rebuffing positive gestures from Japan, the Chinese side should not continue to snub Abe. Xi should publicly reiterate that China values its long-standing relationship with Japan and is prepared to work with Japan to improve relations soon. To help Abe save face, China can convey its concerns about his rightist leanings privately. Meanwhile, the two sides should downplay the collective self-defense and air defense identification zone (ADIZ) issues. Various polls suggest that the majority in Japan still oppose the constitutional change to Japan’s right to exercise collective self-defense. Though he has the backing of the U.S., Abe faces tremendous legislative and societal hurdles to fully execute this right. For Japan, China’s November 2013 demarcation of its ADIZ is obviously offensive. China can keep its ADIZ but does not have to strictly or seriously implement it. Most of all, China’s air and maritime patrols must be decreased proportionally in order to avoid accidental clashes with the Japanese in the disputed areas. Pushing these issues off center stage will help put the relationship on the right track again. Let’s hope that wisdom will prevail on both sides, and that Abe will be courageous enough to take the first step in the next few weeks, and that Xi will quickly reciprocate so that the Abe-Xi meeting can take place in Beijing soon, leading to a significant improvement in bilateral relations. Zhiqun Zhu is a professor of political science and international relations at Bucknell University in Pennsylvania and a POSCO fellow at the East-West Center in Hawaii.